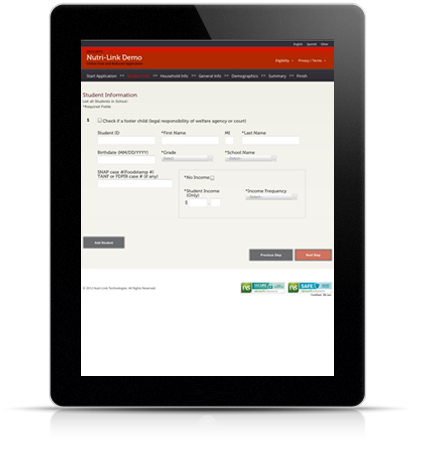 If you’re ready to apply simply click the START APPLICATION button to the right to begin the process. Now you can apply for free or reduced school meals online! The process is quick easy and FREE, and in a few short steps you’ll be done! Since the information you’re providing is electronic we’ll be able to review your application faster than ever before. Your information is protected using the latest and greatest encryption technology, so you can rest assured that your personal information is safe. For more information about how your information is protected, follow this link to review our encryption methods. If you’re ready to apply then simply click the START button to begin. The online application is very similar to the paper application we have used in the past. Both contain all of the details required by the USDA. The quick and simple step-by-step wizard will walk you through the process, resulting in a complete application that is ready for us to qualify!